wo bedrooms two bathrooms, very close to the beach and Port Aventura. Fantastic apartment of 75 m2 with air conditioning of high standing, with 15 m2 terrace with sea views. 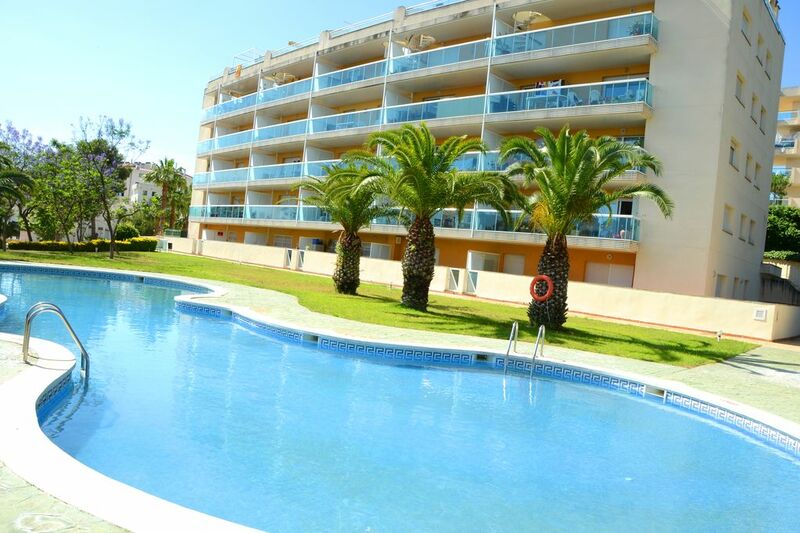 It is very nice, very quiet and bright and is in the area of Cabo Salou. The rent in high season of July and August is made only from Saturday to Saturday. If it is not between Saturdays, please make a "contact the owner and check their dates (without making a reservation request until talking to the owner). There are two double bedrooms and two bathrooms. The kitchen is separate and has all the necessary equipment, dishwasher, oven, microwave, refrigerator and freezer, coffee machine. Parking is underground and closed with direct access to the floor by elevator. Also overlooking the sea, garden and swimming pool and paddling pool. "We completely enjoyed our stay in this apartment, there were 5 of us and we had plenty of room. extremely clean and well maintained. We felt very secure and safe in the area and the apartment. The concerige and his wife were very helpful and friendly. Cap Salou was 5minutes walk, La Pineda about 15 min walk fantastic beaches in both areas. Easy access to bus routes to Reus and Salou (buy multi journey ticket)"
Dommage un peu éloigné des commerces, resto et plages, heureusement qu il y a des navettes si pas de voiture. Appartement tel que décrit dans l'annonce. Propre, spacieux et fonctionnel. La deuxième chambre est un peu bruyante la nuit et la piscine très fréquentée en période de canicule mais nous avons passé de bonnes vacances. Mme Lolli est très efficace. Han sido 7 dias geniales. La vivienda tal y como se mostraban en las fotografías. La urbanización muy tranquila con un gran jardín y una muy buena piscina. Al encontrarse fuera del bullicio de Salou la tranquilidad ha sido absoluta. La plaza de garaje correcta (tengo una Alhambra 2016 y entraba a la perfección). Destacar de la vivienda su amplia terraza con vistas espectaculares a la bahía y también a Port Aventura. Playa a 10 minutos andando. Supermercado a 2 minutos con precios muy razonables. Por último y a destacar la atención en todo momento de Loli y de Isidro preguntándonos si estaba todo correcto y si teníamos alguna incidencia. Desde luego que repetiremos en ésta vivienda y animaremos a otras personas a que vayan a ésta vivienda. très bonne location, tout est comme dans la description. Résidence calme et familiale. Mme Loli et son mari sont très sympa et à l'écoute pour que tout se passe bien. Nous avons passé de très bonnes vacances et nous reviendrons ici ! (Text automatically translated) "Salou and has several beautiful beaches of fine golden sand, shallow, ideal for families. Closer to our apartment (about 400 meters) is the CALA CRANCS, spectacular beauty. Cala also highlights the FONT (about 600 mts.) Also very close to the beach of La Pineda and Cambrils fishing village. not miss if possible, the city of Tarragona (approx. 10 Km) World Heritage by UNESCO, where you can visit the Roman city walls, the amphitheater, the tower of Pilat, the boulevards or Activities in Salou Marina: rental and windsurfing courses, jet skis, events and festivals, flea markets, hot springs area and also highlight in the center of Salou, the wide range of pubs, clubs, restaurants and cinema. miss not be possible if you have more time Barcelona (110 km), with its spectacular architecture and cultural offerings of Reus (12 km), found in the Priorat wine culture and character of the landscape, not miss the village of Siurana. 's also very beautiful Natural Park area of ? ?the Ebro Delta, with possibility to reach car or boat from the port of Salou. To have fun in a big way is the Port Aventura theme park and water park AQUOPOLIS a short distance. "